It was still far short of sunrise in the early-morning hours of April 18, 1989, yet a line of cars stretched near the gates of what had long been a leafy, bucolic private estate at Jericho Turnpike and Southwoods Road in Woodbury. Inside those cars, dozens of local golfers sat waiting to secure a spot on tee at the first Long Island golf course built in a decade. Once the sun brightened the sky over northern Nassau, the Town of Oyster Bay Golf Course officially joined the Long Island golf landscape, welcomed by hundreds of golfers -- nearly 300, per a Newsday recap the following day -- who gave the Tom Fazio design rave reviews. This year is the municipal course's 30th anniversary. Opening day is Tuesday, April 2. This year's golfers will find some subtle differences around the course from when they last left it in the fall. Cart paths have been added or repaved throughout the course, and dozens of trees were trimmed or removed to open up areas of play. "The goal of the trimming project was to make the course more player-friendly, less difficult for the average player and to provide more sunlight exposure on the course to achieve better grass growth," according to Oyster Bay town supervisor Joseph Saladino. "The Town also purchased new golf carts and implemented a plan to purchase ten new golf carts annually to replenish the fleet. Additional projects planned for the near future include improving tee boxes and bunkers, and refining areas near and around the course's water features." Saladino said all improvement projects are being performed under the expertise of the course's new greenskeeper, Greg Kolodinsky, and new consultant Steve Matuza. Despite heavy play, its name designer and a variety of truly impressive holes, Oyster Bay carries on in relative anonymity among outsiders, rarely spoken of in conversations about Long Island's best publics. Perhaps it's due to past restrictions on advance tee times and what used to be a convoluted tangle of green fees and membership rates that ultimately made a trip to Woodbury cost-prohibitive for the curious one- or two-time visitor. Or maybe its location just five miles north of one of the most recognizable public golf facilities in the nation at Bethpage leaves it overshadowed. Town government seems eager to draw a more rightful amount of attention to its course -- Newsday reported in March that the town will run advertisements in New York Mets game programs at Citi Field during the 2019 season. And for the first time in the course's history, tee times can now be booked online and are available for both members (30 days in advance) and non-members (seven days). Those who do know the course are aware of its hilly, challenging layout that includes one of Long Island's most daunting par-4s. The fourth doglegs to a blind landing area on the right before marching dead uphill to an obscured, triple-tiered green (pictured left). The hill itself is covered in rough-length grass and features a long, snaking bunker. Later, the 16th makes a harder dogleg turn to the right, this time leaving golfers with a full, unobstructed view on the approach, which features an elevated green cut into a rolling hillside (pictured below). Oyster Bay's par-3s all feature either dramatically sloped greens, notable elevation changes or intrusive bunkering, if not some combination of the three. Part of what made the debut of the Oyster Bay course so highly anticipated 30 years ago was the era in which it came to be. Locally, the 1980s was associated only with course closures, not openings. The historic Links Club in Roslyn, an exclusive 1919 C.B. Macdonald course, was sold that decade with development of condos in the plans. The failed, celebrity-boasting "superclub" experiment at Muttontown's Charter Oaks in the late 1960s ended quietly in 1982 as a course called Fox Run. The course-building resurgence of the 1960s and early '70s -- which introduced many of Long Island's current municipal facilities -- had slowed by the time Swan Lake Golf Course arrived in Manorville in 1979. In the years that followed, the climate was simply not conducive to golf development. Even a decade later, Oyster Bay's early success was viewed merely as a one-off. In his recap of Oyster Bay's opening day, Newsday's Mark Herrmann cautioned that Long Island's shiny new course was "perhaps its last for a long time." Of course, few could have predicted the Tiger-fueled building craze that would arrive soon after. Adding to the excitement was the history of the grounds. Like many other post-1950s golf courses on Long Island -- especially those around Nassau's "Gold Coast" -- Oyster Bay's fairways and greens sprung from a repurposed private estate. "Woodlands" was built in 1918 and designed by noted architect William Adams Delano. In 1928 it was sold to industrialist, philanthropist and politician Andrew Mellon, who gifted the 121-acre estate to his daughter, Ailsa, as a wedding present. Ailsa, a philanthropist described by the New York Times in her 1969 obituary as the "richest woman in the U.S.," married diplomat David Bruce and remained there until her death. Oyster Bay Town bought the Bruce estate in 1979. According to Newsday, supervisor Joseph Colby -- whose name was added to the course in 2013 -- first visualized using the grounds for golf during a visit to Woodlands. Players don't venture into the estate house -- now a wedding and event venue called The Mansion at Oyster Bay -- during their visits, though they do get a brief taste of old estate life late in their round. The par-3 12th tees off directly in front of an elegant brick patio at the rear of the mansion. The tiny 117-yard hole is not as easy as it seems, with a bunker in front and a green that slopes to a hidden rear water hazard, plus the chance of cocktail-hour guests watching over the shot. The Town of Oyster Bay Golf Course also includes the Lucas Golf Center, which operates the driving range, pro shop and private instruction and is already open for the season. For more on Oyster Bay, visit the Golf On Long Island course flyover. The Southampton-based Last Chance Animal Rescue will hold its fifth annual golf outing on Monday, June 3 at Mill Pond Golf Course in Medford. All proceeds from the event benefit the non-profit organization's efforts to rescue animals from inhumane kill shelters and relocate them to safe facilities and foster homes. Shotgun tee time is scheduled for 1:45 p.m. Format for the outing is team scramble. And for the first time in the outing's history, a $10,000 par-3 hole-in-one prize will be up for grabs on Mill Pond's 179-yard tenth. Prior to golf, the festivities begin with a 12 noon BBQ lunch and practice on the driving range. The $175 entry fee also includes on-course beverages and a 6:00 p.m. post-round dinner, complete with three-hour open bar and the chance to win auction items and raffle prizes. Dinner-only guests can attend for $60. Participants can register online at the outing website. And to learn more about Last Chance Animal Rescue, including information on adoption, fostering and volunteering, visit the organization's website at www.lcarescue.org. Cherry Creek's "Double Play" spring special will be back in 2019. For more information, call the Woods at (631) 506-0777 or the Links at (631) 369-6500. And for details on the two Riverhead courses, check out the Woods and Links flyovers. Pine Ridge Golf Club will ring in the March holiday and the new 2019 golf season with a special "Shamrock Open" set to tee off on St. Patrick's Day morning. Shotgun tee time at the Coram course is 11 a.m., and when the round is over, the celebration continues with a late-afternoon dinner party. The $65 entry fee covers golf and Irish-themed festivities, which include beer, wine, live music and raffles. Party-only guests can also register for $35. Sign up online at the Pine Ridge website. For more on Pine Ridge, check out the course flyover. After a successful inaugural match-play championship in 2018, Spring Lake Golf Club in Middle Island is planning a second tourney this April with a bigger field and condensed play. The 2019 Spring Lake Championship, open to golfers of all skill levels, will take place Friday, April 26 through Sunday, April 28. Unlike last year's double-weekend event, this year's edition will be held over one long weekend, starting with a seeding round on Friday. First round and semifinals will be played on Saturday with the final matches scheduled for Sunday. Entry fee is $420 per two-person team and covers up to four 18-hole rounds in best-ball format (two rounds guaranteed), in addition to range balls and a Friday evening dinner with open bar. This year's field will be expanded to 56 teams divided into Men's, Women's and Senior divisions. The three divisions will include championship and lower flights each comprised of eight teams. The seeding round will tee off at 1:00 p.m. on Friday. First-round matches will begin at 7:00 a.m. Saturday, with semifinal matches to follow in the afternoon. Championship matches will begin at 10:30 a.m. Sunday. Prizes will be awarded as pro-shop credit to winning teams in each flight. All rules and format details are listed on the official registration form available on the Spring Lake website. Sign up by submitting the registration form or call the Spring Lake pro shop at (631) 924-5115. This promises to be a spring unlike any other at Bethpage State Park, where work and preparation for this May's PGA Championship on the Black Course carried on through the winter and will soon continue amid the din of refreshed Long Island golfers. Local players will have to make a few sacrifices, however, before play at the park returns to normal following the tournament. New York State recently announced reopening dates at the park along with information on modified holes impacted by PGA infrastructure. The Green Course will reopen on Saturday, March 16 with temporary tees on holes #1 and #18. Also reopening on March 16 is the Yellow Course, which will be available only for nine-hole play. Yellow is typically open all winter but closed in late fall for PGA prep. Bethpage Red will reopen on Friday, March 29 with temporary tees on #1 and #5. The Blue Course -- the only course to remain open this winter -- will have a temporary tee on #1. As for the Black Course, the park plans to offer restricted walk-up play from Saturday, April 13 to Sunday, April 28, weather permitting. Normal play is expected to resume on Saturday, May 25. For more info, call the park at (516) 249-0700 or check the NYS reservation website. In addition to parades, green-tinted bagels and adult beverages, St. Patrick's Day is known, at least to local golfers, as the unofficial start of holiday-themed outing season. A handful of Long Island courses celebrate the dawn of a new golfing year by inviting players to chilled fairways for golf and a side of corned beef and cabbage. Mill Pond Golf Course will hold its annual St. Patrick's Day Golf Classic a bit early, with a 10:00 a.m. shotgun tee time scheduled for Friday, March 15. Format for the outing is four-person scramble. Entry fee is $79 (pre-payment required) and covers golf, cart and range balls in addition to a hot Irish buffet, draft beer and wine. Prizes will be awarded to the top three teams and winners of closest-to-pin and long-drive contests. To register for the St. Patrick's Day Golf Classic, call (631) 732-8249. In the event of inclement weather, the outing will be canceled and all registrants will be refunded. For more on Mill Pond, check out the course flyover. 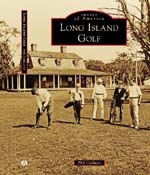 GOLI's Images of America: Long Island Golf -- BUY THE BOOK! Golf On LI's "Nassau 18"
All content published on this site, including written entries and golf-course photography, is the property of Phil Carlucci and Golf On Long Island. All rights reserved. 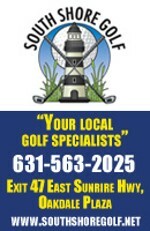 For permission to use photographs or text excerpts in your website or publication, please contact Golf On Long Island at phil@golfonlongisland.com.